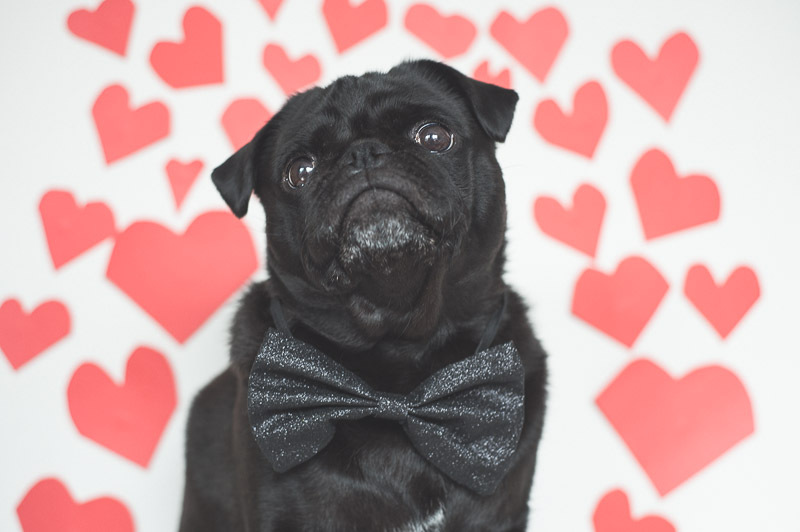 With Valentines Day just around the corner and this week’s pug photo challenge theme being LOVE, I wanted to share with you some simple and cute DIY Valentine pug photo props for you to get making and using in photos. Not only are these simple and cute, they are super cheap and you can do a few different styles of photos with the same props. Who doesn’t love that? The first thing to do is to have your sheet of cardboard flat. Using a pencil and the cake tin, create semi circles to form a heart. I did this at the corner of the cardboard so that I only had to cut the curved edges as I am using the corner edges for the bottom half of the heart. Now I did this two times at opposing corners so that I would have two large hearts. Cut these out but keep the remaining cardboard for the next set of photos. Now with the first heart, you can use it as is in a photo or you can get your sharpie and write on it “Be Mine”. This is the first photo I created using the first heart with “Be Mine” written on it. 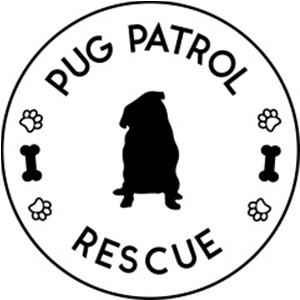 Now with the second heart, you will need to cut a circle out of the middle according to your pug’s head. 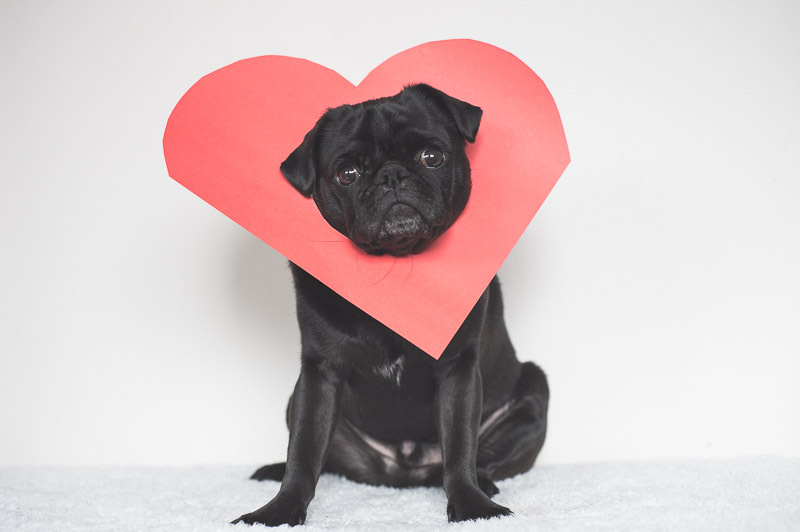 This is going to look so cute as you will put the heart over your pug’s head. 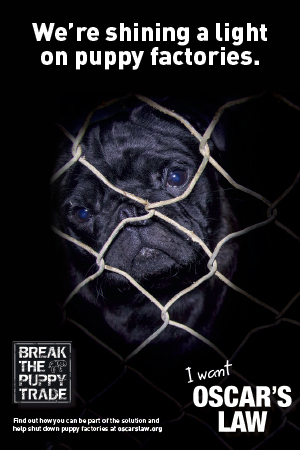 Here is an idea from the photo I created. Now we get to use the left over cardboard to cut out as many small hearts as you can. I cut out about 24 hearts of different sizes and well different shapes of hearts as I did it free hand. 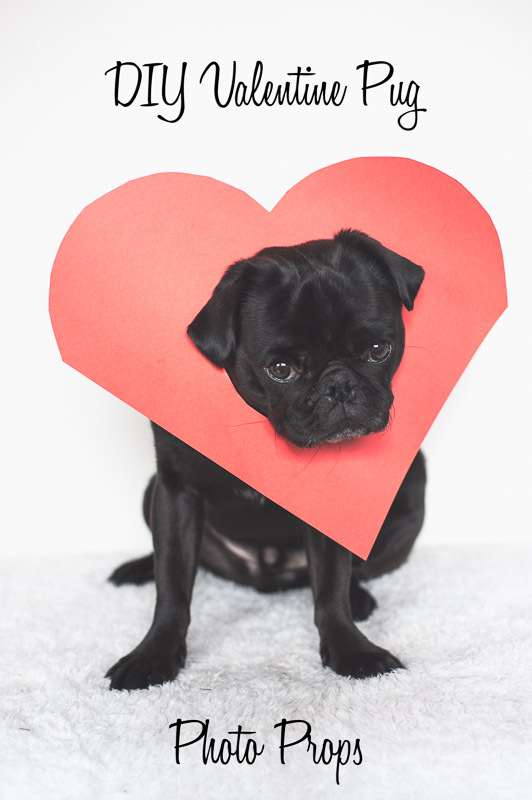 The first photo I used these hearts for was just to scatter them around Ref whilst he was sitting or lying down and getting him to look up at me whilst I take the photo from above. 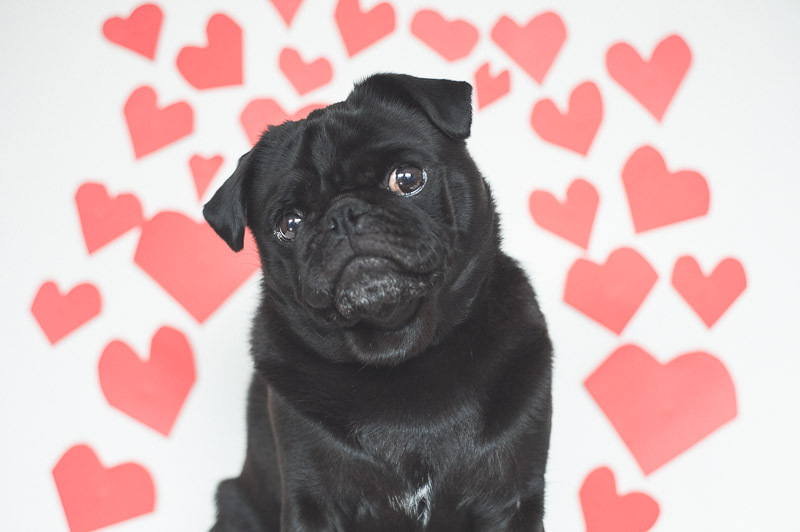 The second image I created using the hearts was using some blu tack to stick them to a light coloured wall to use as a backdrop. You can stick them to the wall in any creative way you like. Maybe even create a heart on the wall using the small hearts. Here is what I created using the small hearts on the wall. 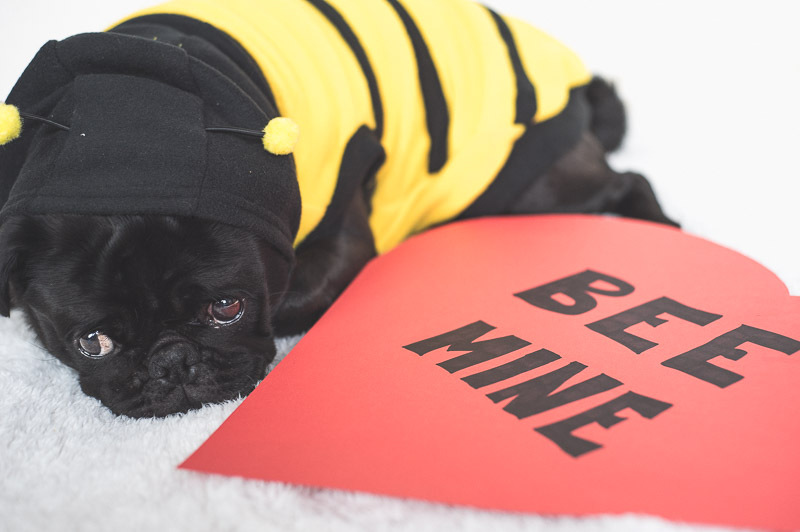 Or maybe you have a cute costume like this bee one. 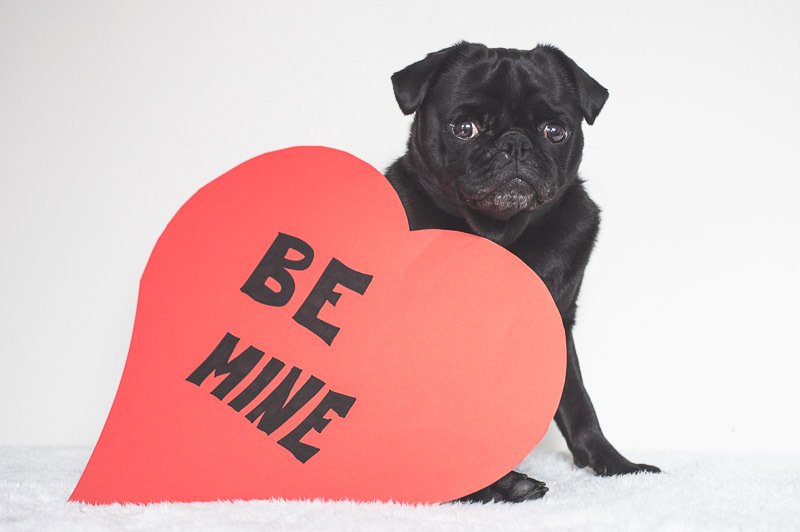 Whatever you have, just have lots of fun creating some fun loving images with your pug. And make sure you share your photos with on Instagram, Facebook and Twitter. We love seeing your photos. These are ADORABLE!!!! 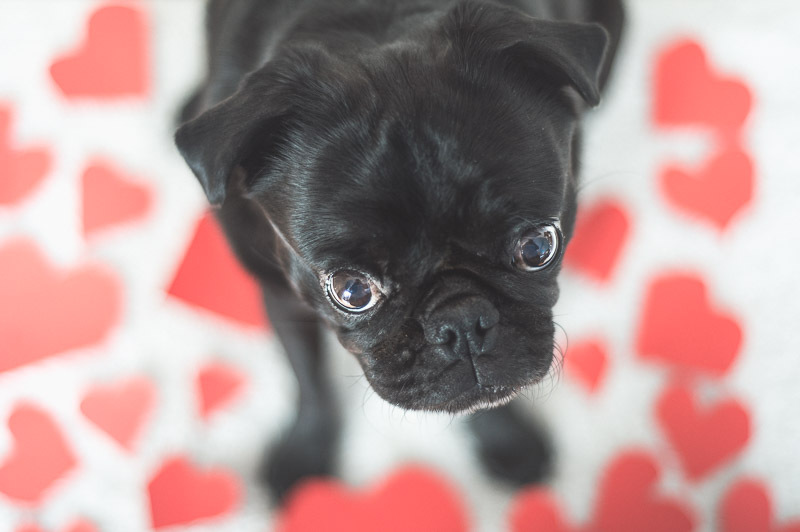 I really like the idea of miniature hearts scattered around the floor 🙂 I’d love to try the head through the heart thing although I know my two would run around crazily trying to rip it off! Thank you Amy! Just remember that taking photos of your dog needs to be taught. Start with basics then introduce the camera. Once they are cool with it, then you can start to introduce props. 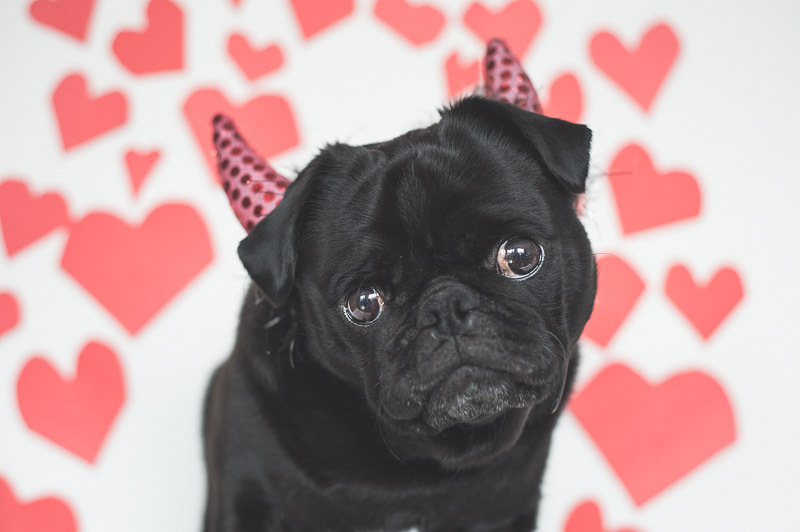 Have fun creating some valentine’s photos anyway. Thanks for stopping by Larissa. Please share the photos that you take with us on Facebook. Gorgeous ideas! I’ll be trying them out with Indy tomorrow. Thanks Vanessa. Can’t wait to see the photos. I’m sure Indy will be adorable with a heart around his head. Thank you Andrea! Ref loves being in front of the camera which helps. Thanks for stopping by Raphaelle. I’m very lucky to have this boy as my model.